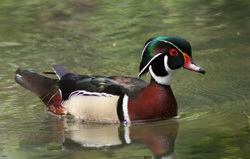 The Wood Duck is the most common nesting duck in Tennessee. Its breeding range extends from southern Canada throughout the eastern half of the United States, along the Pacific Coast and scattered locations inland. It winters in the southern three-quarters of the breeding range, and in southwestern United States. 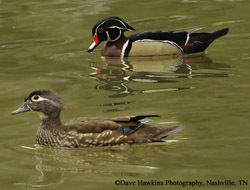 Nearly hunted to extinction during the late 19th and 20th centuries, Wood Duck populations have increased since the 1960’s and today the Wood Duck is a common breeding species and an uncommon wintering duck in Tennessee. The recovery is due to maturing woodlands across the state, protection provided by Migratory Bird Treaty Act of 1918, and to aggressive nest box programs on public and private lands promoted by TWRA. Largely considered to be the most beautiful of all North American waterfowl, the Wood Duck has a unique boxy shape, a crested head, a thin neck, short wings, and a long, broad tail. In flight, it holds the head up high, sometimes bobbing it. Male: a brightly patterned iridescent-green and white head, with a long crest, a red bill and eye, a black back, a dark reddish chest, and pale golden sides. In June-September it displays “eclipse plumage” resembling female but retaining the head pattern and reddish bill. 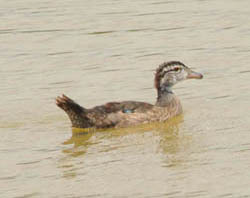 Female: overall gray-brown with a white patch around the eye, and a bushy crest on the head. In flight, both the male and female show a green patch (speculum) in the wing and a white belly. The upward-slurred flight-call of the female is distinctive. The male’s call is a high, thin, drawn-out jeweep. The Wood Duck thrives in bottomland forests, swamps, freshwater marshes, and lakes located near woodlands. Also found along streams of all sizes from creeks to rivers that provide plenty of vegetative cover for foraging and hiding. Studies indicate a varied diet including: aquatic plants and insects, terrestrial arthropods, seeds, acorns, and berries. Wood Ducks were nearly hunted to extinction during the late 19th and early 20th centuries. Management efforts have been successful and there are now well over a million Wood Ducks in North America. If nest boxes are placed too close together, several females may lay eggs in the nests of other females. These "dump" nests can have up to 40 eggs and very few, if any, eggs hatch. After hatching, the female stands on the ground and calls to the young. The ducklings jump from the nest tree, from heights over 100 feet without injury, and follow her to water. 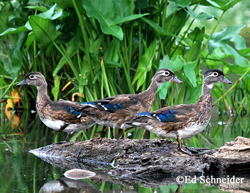 Wood Ducks typically produce only one brood, but it is not uncommon for them to have a second brood. Nesting in Tennessee begins in late February or early March. Traditionally the Wood Duck nests in tree cavities near water, sometimes directly over water, but may nest up to a mile away from water. Chicks hatch with a full coat of down. They leave the nest within 2 days of hatching by climbing up the interior wall and jumping out of the cavity entrance. The ducklings make their way to water as the mother calls them to them. Wood Duck boxes should be constructed of natural wood as they resist heat build-up when measured against those constructed with non-wood materials. Wood’s natural insulation properties protect eggs during hot, late season incubations. Cedar lumber is recommended for durability. Use natural, uncoated wood such as cedar or redwood which are more durable than pine or exterior plywood. Use at least ¾ inch boards. The entrance hole should be 3 inches high and 4 inches wide, which will exclude most raccoons. You may consider raising the floor of the nest box ¼ inch up from the bottom of the box to prevent rotting. Be sure to include a section of hardware cloth on the inside of the box below the entrance hole to act as a ladder for the young ducklings to climb out. Place a couple inches of saw dust or wood chips in the bottom of the box for nesting material. Use of a predator guard on the nest pole is recommended. The location of the box should allow the hen easy access and flight path to the box. It can be installed on land or over water within the forest. However, land-based boxes are advantageous because they can be monitored without boats or waders, and they eliminate worries about varying water levels. Do NOT place boxes in the middle of a pond or lake such that the boxes are not in the woods (see Egg Dumping below)! It is generally recommended that nest boxes should be placed at least 300 feet apart and should not be visible to one another. Do NOT place several boxes in close proximity in open water! We recommend placing boxes 30-100 ft from the waters’ edge in the woods, but boxes can be erected much further away from water. The entrance hole should face water, especially when the box is within 30 to 150 feet of the shoreline. Make sure that the “path” from the box to the water is free from hazards for the ducklings (highways, street curbs, or wire fencing). Your box should not be placed on a tree. For protection from predators, it should be placed at least nine feet away from a tree trunk and more than eleven feet from an overhanging branch. Ideally, mount the box on an 8 ft. metal highway sign post, however 4 inch x 4 inch cypress, cedar, or treated wood post can be used. The metals poles are sturdy and have holes along their length to easily accommodate mounting of nest boxes. Sink the post 2 feet into the ground so that the hole is 6 feet from the ground. A predator guard installed just beneath the nest box will prevent access to the box by predators like raccoons and snake and by nest competitors. A metal, three foot diameter, cone-type guard is strongly recommended. Hooded Mergansers may use Wood Duck nest boxes. Hooded Mergansers primarily breed in the western third of Tennessee, but are occasionally found nesting in middle and east Tennessee. Artificial nesting structures are often mistakenly erected close together and in highly visible locations, such as the center of a pond. Clustering nest boxes in open areas was originally thought to be a positive thing for attracting high densities of Wood Ducks, however this is one of the worst things you can do for Wood Ducks. Clustered nest boxes results in egg dumping. Egg dumping occurs when a female Wood Duck follows another hen to a nest site during the egg-laying period. The visiting bird is stimulated to lay eggs in the nest of the other hen. Egg dumping is not typically a common phenomenon since Wood Ducks tend to not nest too close to each other when nesting in natural tree cavities. A hen whose nest is dumped with too many eggs may abandon it. Where egg dumping is out of control, hatch rates may drop to as low as 10 percent. Because of this, it is critical to locate nest boxes in isolated locations as described above. Alternatively, if Wood Ducks are very rare in the area, it may be necessary to place boxes in open areas initially to encourage use, and then moving them to more secretive locations as the populations increase. Cleaning a box is advisable as soon as possible after a hatch if you want to obtain an accurate count of the hatch numbers. This also readies the box for a second use in the same season. Cleaning your box by late summer or fall is recommended. It should also be rechecked for winter damage just before egg-laying begins in the spring.